1. Blanch the broad beans in a pan of simmering water for 2-3 minutes. Drain and refresh under cold water, then slip from their skins. Tip into a small food processor with the spinach, basil, almonds, garlic, lemon juice, 1 tbsp oil and 1 tbsp warm water. Whizz to a pesto and season, adding more lemon juice to taste, if needed; set aside. 2. Put the remaining 1 tbsp oil in a large non-stick frying pan over a medium heat. Break the eggs into the pan and fry, occasionally basting with the oil, until set on top and the underside begins to crisp. 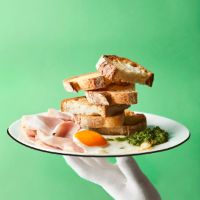 To serve, divide the toast, eggs and ham between plates, adding a dollop of the pesto.